Truck and Auto Carpet Kits can revitalize your old smelly, dirty vehicle! I’m sure you have a bunch of questions about truck and auto carpet kits. Costing around $150 to $300 these kits are a great alternative to a messy, smelly and dirty car. Auto carpet kits significantly enhance the appearance of the interior of your vehicle and help improve your vehicles self image! So here’s some questions you need to consider and answer before you go to the effort of installing replacement auto carpets in your car, truck, van or SUV. Why replace your vehicles carpet? Three groups of people replace auto carpets. The first group are the “Restorers”. These people spend lots of time looking for an old vehicle to rebuild and then spend even more time and a lot of money restoring the old vehicle of their dreams to like new condition. 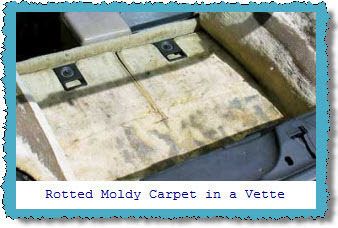 You “Restorers” replace car carpeting because the vehicle you are restoring doesn’t have carpeting or the carpeting has rotted away and you need everything to be new and shiny. The second group is made up of people who replace car carpets because the old carpets are rotted, permanently stained, faded, burned or so full of mildew, mold and allergens that you sneeze yourselves to death every time you get in the car. This second group may be trying to get rid of their vehicle and a new carpet can improve the resale value. The third group is made up of people kinda like me. Every once in awhile I just get a hankering to mess with the car and do something to change it. Carpeting is a simple job and doesn't affect the mechanical operation of the vehicle. So if I mess something up, I have to look at it, but I can still use the car. No matter which group you belong to an auto carpet replacement job is a good fun way to spend some time and bucks. What’s included in auto carpet kits? : The truck or car carpet kit you buy usually comes with the carpet, either “Cut and Sewn” or Pre-Molded , and installation instructions. Make sure to ask the merchant you are buying the carpet kit from if the kit includes front and back areas and any cargo areas that are currently covered by carpet in your vehicle. For example, does the SUV carpet kit you want to buy include carpeting for the cargo area. If you are restoring a vintage auto you most likely are going to get a “Cut and Sewn” carpet kit. Make sure the kit includes carpet to cover all the floor areas you want to cover. Just in case the kit doesn't include carpet to cover all the areas you want to cover, make sure you can buy same color carpet pieces to match the auto carpet kits uncovered areas. What tools do you need? : Well you might have to remove door sills, seats and seat belt anchor posts so you usually need an array of screwdrivers and/or sockets and a Torx or Star bit may help when you go to remove the seat belt anchor post. If you are buying additional padding for extra insulation and sound deadening you may want to use an adhesive to anchor the extra padding to the floor. A really sharp pair of scissors and a box cutter or utility knife will help you trim the excess carpeting. And of course, my favorite, a 12 pound sledge hammer just in case you need to make some minor adjustments or need to vent as you’re adjusting the carpeting to fit. (1) Color. Do you match the existing color? Do you pick an Xtreme color? Request samples to help you make the color decision. (2) Style and Type. What style and type of carpet do you want? There's loop or pile, nylon or polypropylene, and more to consider. Request samples to help make a good choice. (3) Backing. What kind of backing and or padding works best for your vehicle – latex, polyethylene or mass back? (4) Extra insulation. Do you need an extra layer of insulation and/or sound deadening material? (5) Adhesives. Are you going to use an adhesive to secure carpet to vehicle floor? (6) Replace panels, sills, mats. Do you want to replace door panels, sills, kick panels or floor mats at the same time? Who makes Auto Carpet Kits? There are 3 primary manufacturers of truck and auto carpet kits in the USA and a great manufacturer in Australia who has been in business for over 30 years. Auto Custom Carpet (ACC), Newark Auto and Nifty(Lund International) in the USA and Tru-Fit Carpets in Australia are the places to go when you need to replace your vehicles carpeting. ACC better known as Auto Custom Carpets is the largest manufacturer in the USA of replacement automobile carpets. Every kit from ACC is made to order and doesn’t sit on a shelf where it can deform. They have a big selection of automobile carpet colors including their Xtreme colors. ACC has a large growing dealer network and a really wow selection of carpeting materials. ACC currently commands approximately 80% of the marketplace and is the most popular vehicle carpet kit among both Restorers and us normal people. ACC sells auto carpet kits direct to the customer and through a network of dealers and installers like AutoBarn. Newark Auto sells replacement carpeting, truck floor mats and a lot of other neat stuff and all of it may be purchased through the Newark Auto Ebay store and via a dealer network. Lund(was Nifty) makes their Pro-Line Replacement Automobile Carpets out of heavy duty nylon carpet pressure molded to the exact shape of your vehicles floor pan. A mildew resistant backing and a factory style heel pad adorn this replacement carpeting. The back of most of Lunds molded carpets are pre-marked with holes for shifters, seat brackets and other protrusions. But you may have to do some of that work yourself. The carpeting may get wrinkled in the process of shipping it to you so be prepared with a clothes steamer to remove the wrinkles, just in case. Lund(Nifty) sells through their carpet replacement kits through a dealer network which includes many of the on-line, internet auto parts websites like Auto Anything and J.C. Whitney. Tru-Fit Carpets is based down under in Australia. The company has been making replacement carpeting, car floor mats, 3D car mats, felt carpet padding and sound deadening and insulation products for over 30 years. The also make hood bonnets which is an unusual, sometimes hard to find product. You can purchase their products through their website or eBay store. Universal absorbent car truck floor mat protectors absorb water, gas, oil and other gunk/mud that will stain your floor mats and sneak in between your car floor mats and your new carpeting. Then you have a problem: the trapped moisture is a breeding place for molds and mildews. Nasty odors, slimy stuff and ... Oh!!! ... I don't want to think about it. These mats also protect your shoes from excess water on the top of rubber mats and are easy to clean. I use 'em.